There was zero drama in the pick-up and delivery to Boulder including the 1400 mile drive to Bozeman, MT. Scott Westfall did a superb job of client relations with the owner. Scott flew to Bozeman, taking two days out of what must be one of the busiest schedules possible to make sure the transition went well, and it did. Peter Baur, Brody and I did the driving bit with just over 1400 miles in two days out and back to Bozeman. Bob Caldwell did a great job on organizing the funds for the purchase. Lee Kuhlke did great work organizing the trailer and new glider quotes and costs. 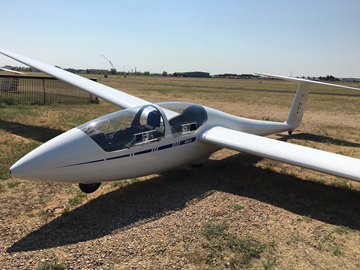 The glider is absolutely beautiful and in pristine new condition. Everything from the seat cushions to the finish are in perfect shape.The Black Forest trailer turned out to be excellent with one exception being the fuselage dolly which depends on having the lift pins secured by two side position rods. These rods are held in place by pins, except there are no holes in the lift pins to secure the positioning rods. Right now the side positioning rods are held in place by straps which is an improvisation. This arrangement makes the fuselage dolly a bit of a hazard when loading and unloading so be careful in the extreme when moving the fuselage in and out of the trailer.In all this is one beautiful glider set up my a consummate professional the prior owner Greg Mecklenburg to a high standard. It is hard to describe just how perfect this glider is. I cannot tell you how incredibly lucky the club is to have this glider added to the fleet. This deal almost fell apart several times and was contingent on several very unlikely events occurring but in the end the stars aligned.